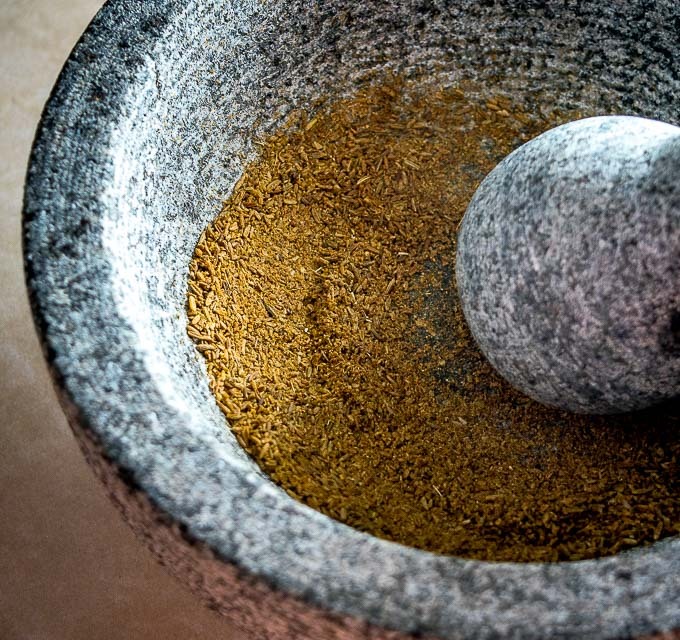 Long before blenders came around people were using a stone bowl and club to grind up various ingredients to feed their families. 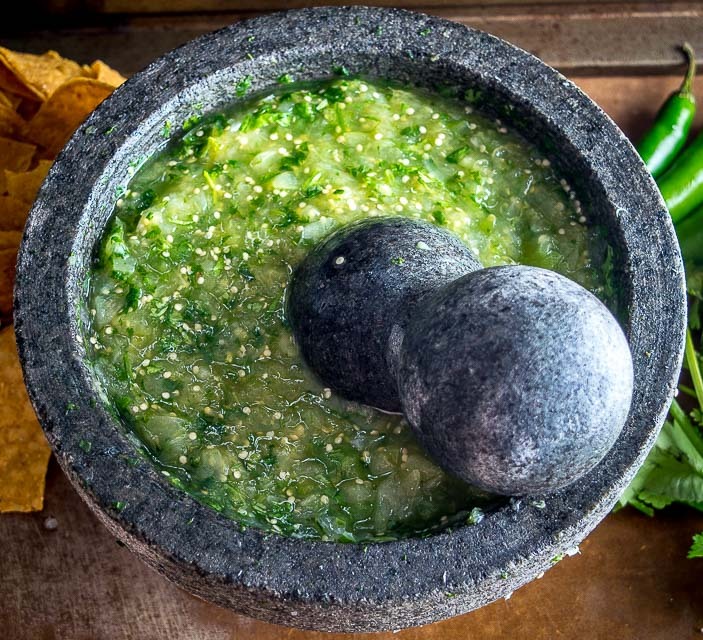 Typically referred to as a mortar and pestle in the United States, you’ll see these referred to as molcajetes if you’re in Mexico or Latin America. 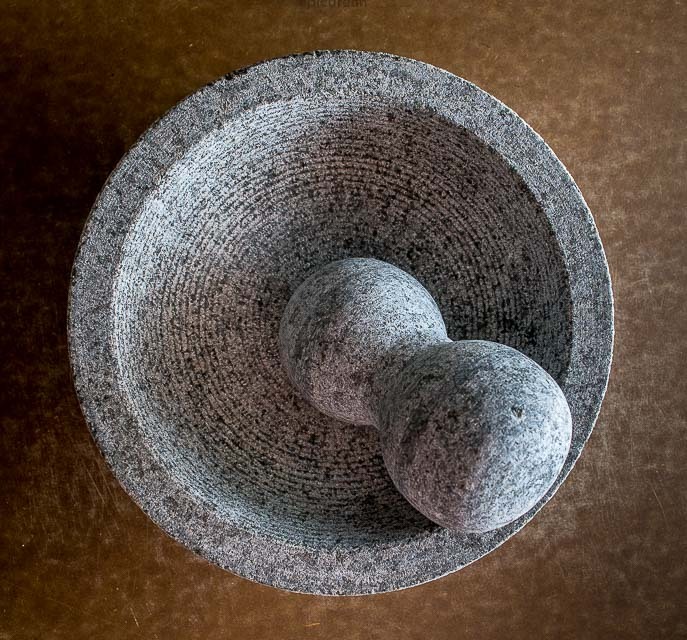 Here’s a granite molcajete that I’ve been using a lot recently. Sometime you’ll come across volcanic (basalt) versions, but the granite versions are becoming more common. The hand tool is referred to as a pestle in the States, and in Mexico it’s a temolote. But it’s always heavy and that’s the key to this versatile kitchen tool. The weight makes it easy to crush spices and chilis. But that’s not the only reason molcajetes are making a comeback. Rather, it’s the flavor they can generate that’s making them popular these days. 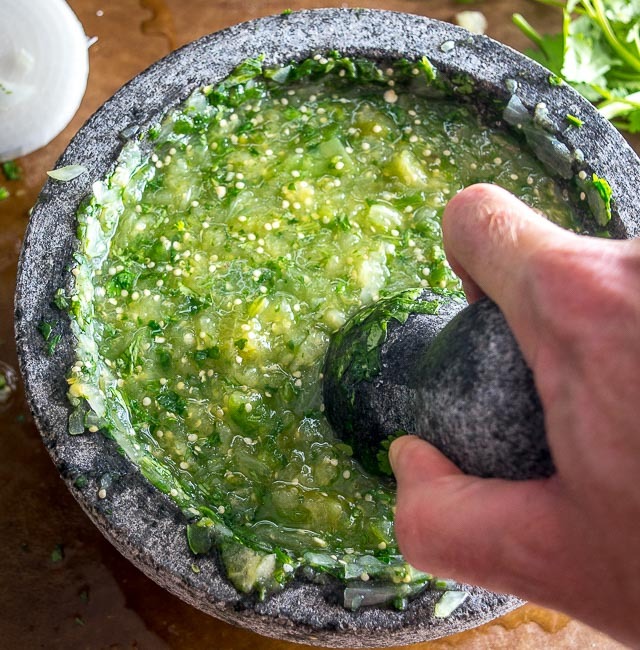 Not only does cutting style affect flavor, but when you crush certain veggies in a molcajete you are releasing even more flavor (and oils) that lie dormant when lightly chopped. In a nutshell, it’s the flood of enzymes that gets released that makes all the difference. Science aside, the real proof is in the taste so I highly recommend trying it out for yourself. You can get a good quality granite molcajete on Amazon for about 15 bucks, so the initial investment is small compared to the lifelong benefit of owning one of these beauties. Before using it for the first time it’s worth curing it. Sometimes you’ll see this process referred to as “seasoning” the molcajete. Basically you are just ensuring that no sediment releases from the molcajete into your dish. 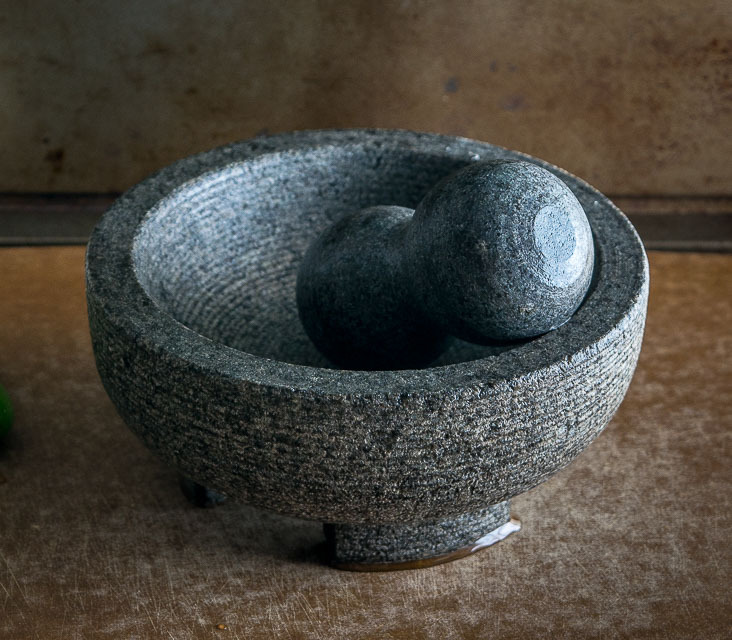 Sometimes there can be grit or loose sediment in molcajetes that are more porous, so running it through a curing process will remove that sediment. Add a handful of rice and a splash of water to the molcajete. 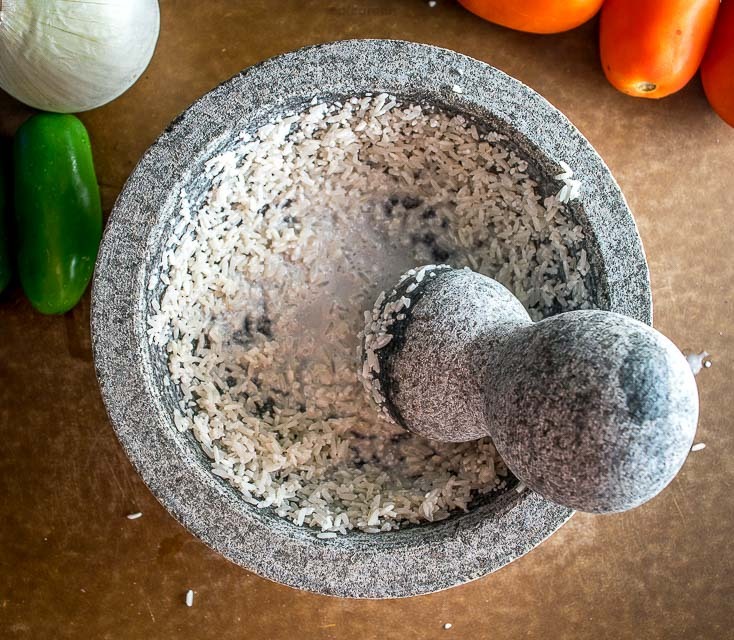 Use the temolote (pestle) to crush the rice. Try to crush the rice across the entire surface area of the molcajete. If you see grit or sediment in the rice mixture then rinse it out and do it again. Eventually you won’t see any grit released into the rice mixture. This particular molcajete that I’m using isn’t excessively porous, so I only had to do crush the rice a single time. Luckily you’ll only have to do this curing process one time. 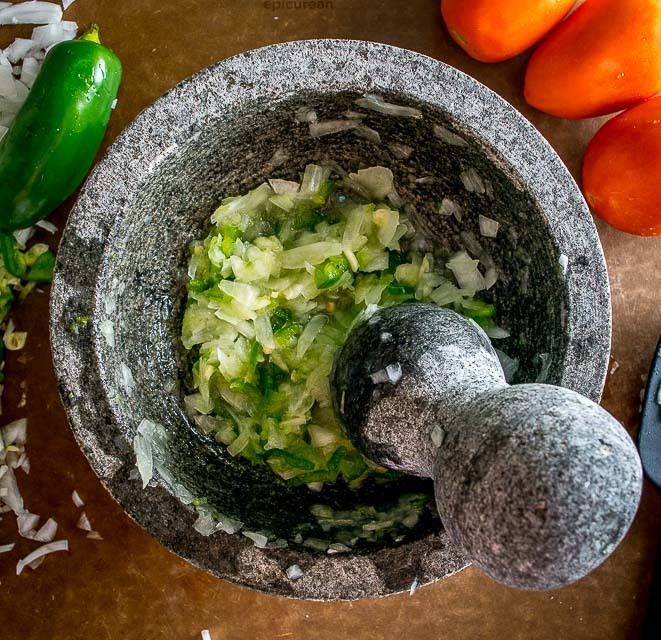 Once cured, your molcajete will be ready for a lifetime of use. Okay, now that we got the boring stuff aside, let’s talk about the fun stuff! 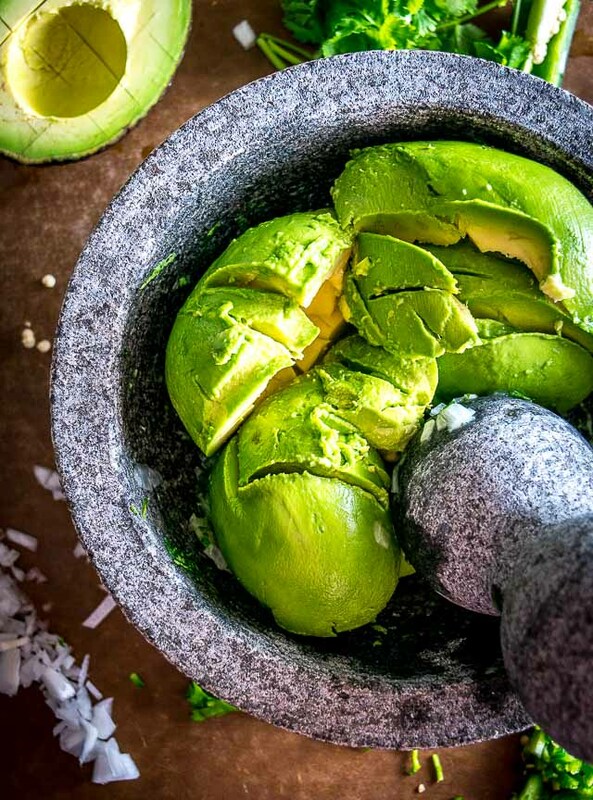 And in particular, let’s look at a few recipes for salsas and guacamoles that will instantly upgrade your kitchen. 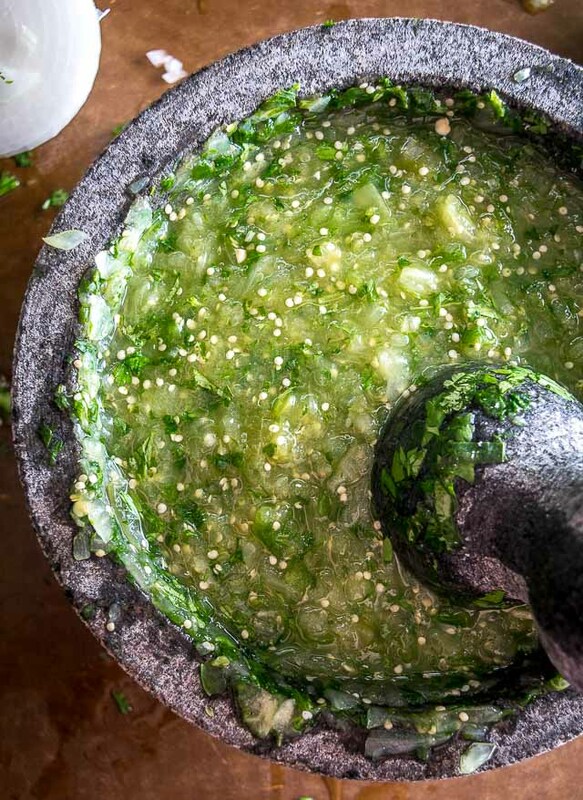 A roasted Tomato Jalapeno Salsa is the perfect starting recipe for your new favorite kitchen tool. 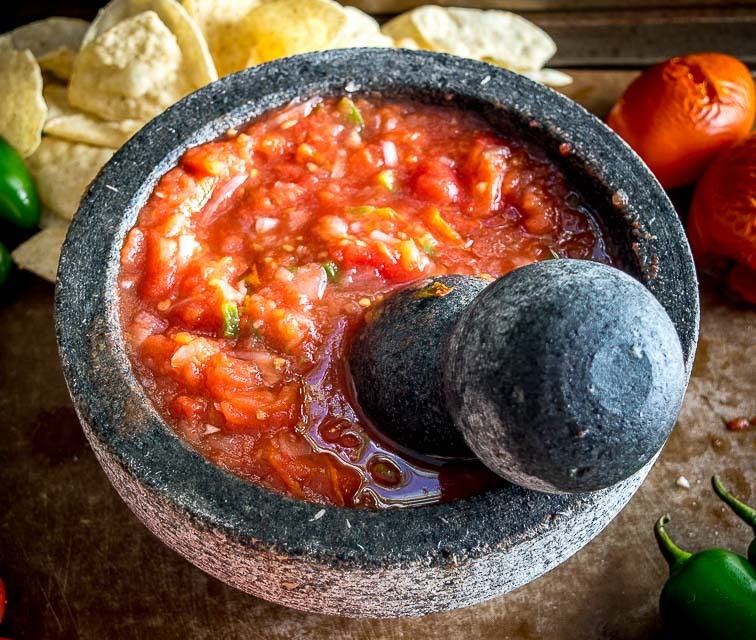 It’s a classic red salsa that will instantly prove to you the benefits of making your salsa in a molcajete. Start by roasting the tomatoes. I usually put them in the oven for 20-25 minutes. Finely chop the 1/2 onion, 1/2 jalapeno, and single garlic clove and add them to the molcajete along with a pinch of salt. Use the weight of the temolote to grind them into a paste-like substance. 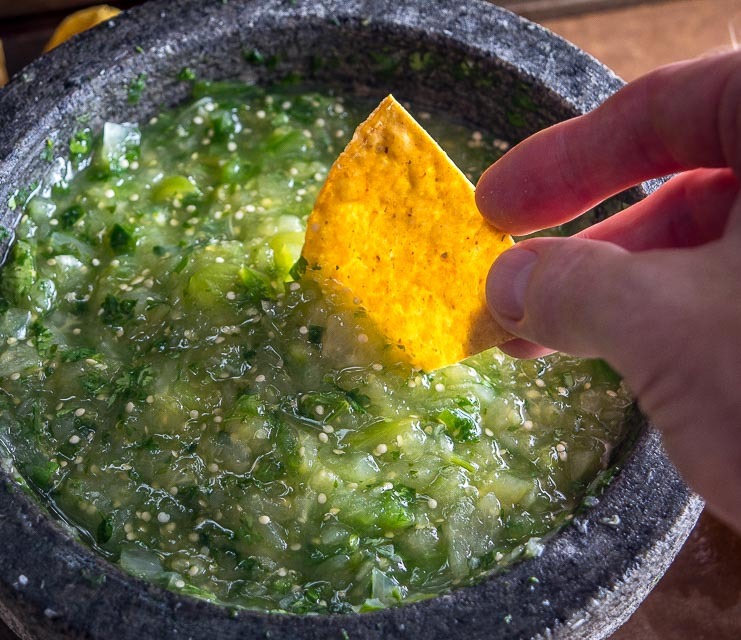 You can use the same process to make a killer batch of Salsa Verde. After roasting the tomatillos you can add them to the remaining ingredients and grind them together. 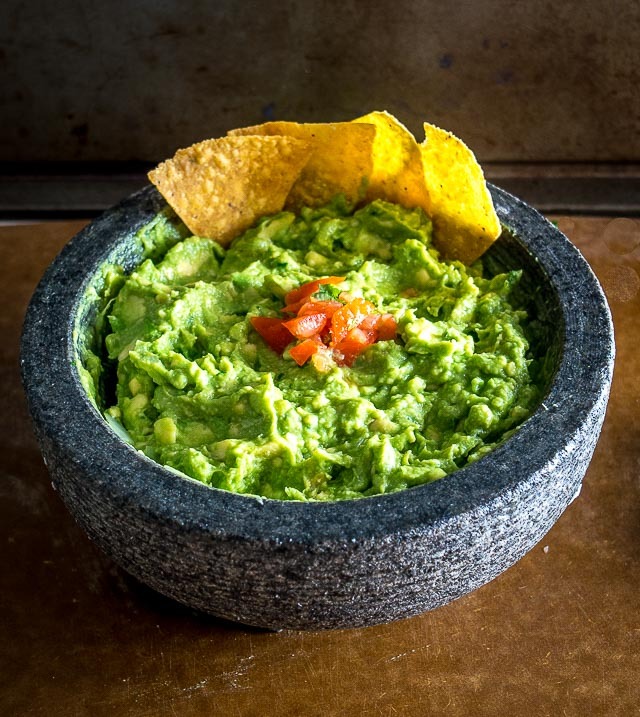 It’s one of the simplest and most rewarding guacamoles you’ll ever have. (Detailed instructions here.) It’s unreal how much flavor it has considering there are so few ingredients. Which brings me to the biggest fear people have about molcajetes: cleaning them! I had those fears too, with visions of food bits getting stuck in the molcajete that could negatively impact all future dishes! 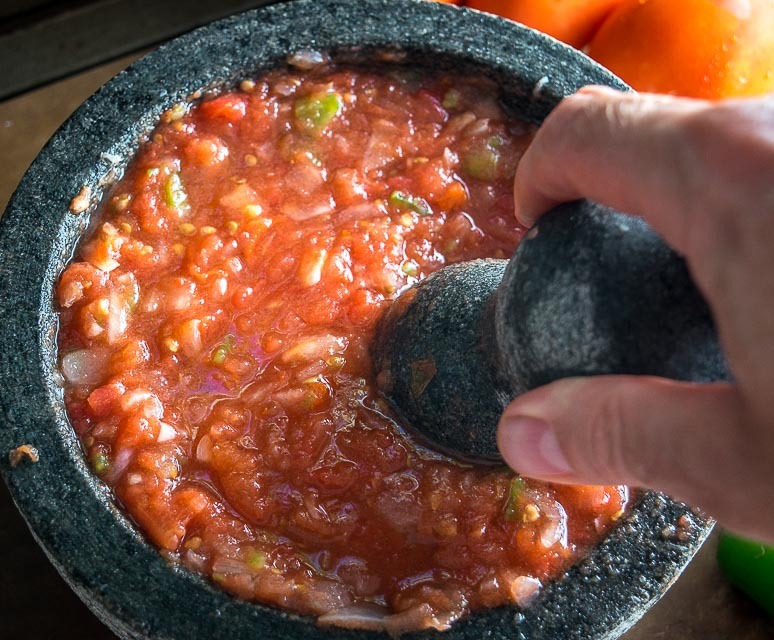 But the truth is that most molcajetes these days, including this one, are not excessively porous so a simple scrubbing with hot water and a small amount of dish soap will easily clean it. Sometimes you’ll see people warn to never use soap in molcajetes. I think it mostly depends on the porousness, i.e. if there are visible gaps and air pockets in the surface then it’s conceivable that a bit of soapy flavor could get stuck in there. But for most molcajetes, including mine, a little bit of soapy, hot water gives it the perfect clean. Of course, you are welcome to reconsider based on the particular material of the molcajete you own. Okay, feel free to get in touch if you have any questions about your soon-to-be new favorite kitchen tool. You can use the comments section below or you can always send me an email.